#OccupyWallStreet protests are now well into their second week, and they are increasingly capturing the public spotlight. This is because, whatever limitations their occupation has, the protesters have done many things right. 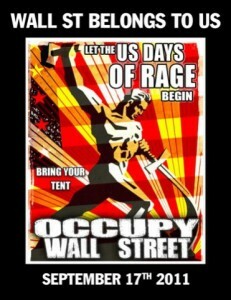 I will admit that I was skeptical about the #OccupyWallStreet effort when it was getting started. My main concerns were the limited number of participants and the lack of coalition building. One of the things that was most exciting about the protests in Madison—and the global justice protests of old such as Seattle and A16—was that they brought together a wide range of constituencies, suggesting what a broad, inclusive progressive movement might look like. You had student activists and unaffiliated anarchists, sure; but you also had major institutional constituencies including the labor movement, environmentalists, faith-based organizations, and community groups. The solidarity was powerful. And, in the context of a broader coalition, the militancy, creativity, and artistic contributions of the autonomist factions made up for their lack of an organized membership base. 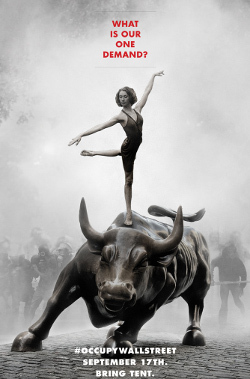 With #OccupyWallStreet the protest did not draw in any of the major institutional players on the left. Participants have come independently—mostly from anarchist and student activist circles—and turnout has been limited. Some of the higher estimates for the first day’s gathering suggest that a thousand people might have been there, and only a few hundred have been camping out. That said, this relatively small group has been holding strong. As their message has gained traction—first in the alternative media, and then in mainstream news sources—they have drawn wider interest. On Tuesday night, Cornel West visited the occupied Zuccotti Park and spoke to an audience estimated at 2000. Rallies planned for later in the week will likely attract larger crowds. People will come because the occupation is now a hot story. 1. They chose the right target. The #OccupyWallStreet protesters have been often criticized for not having clear demands. They endured a particularly annoying cheap shot from New York Times writer Ginia Bellafante, who (quoting a stockbroker sympathetically) resurrected the old canard that no one who uses an Apple computer can possibly say anything critical about capitalism. Such charges are as predictable as the tides. Media commentators love to condescend to protesters, and they endlessly recycle criticism of protests being naïve and unfocused. I am among those who believe that the occupation would have benefited from having clearer demands at the outset—and that these would have been helpful in shaping the endgame that is to come. But protesters have largely overcome the lack of a particularly well-defined messaging strategy by doing something very important: choosing the right target. Few institutions in our society are more in need of condemnation than the big banks and stockbrokers based where the critics are now camped. “Why are people protesting Wall Street?” For anyone who has lived through the recent economic collapse and the ongoing crises of foreclosure and unemployment, this question almost answers itself. Does anyone really not know what the basic message is of this protest: that Wall Street is oozing corruption and criminality and its unrestrained political power—in the form of crony capitalism and ownership of political institutions—is destroying financial security for everyone else? So, yes, the people willing to engage in protests like these at the start may lack (or reject the need for) media strategies, organizational hierarchies, and messaging theories. But they’re among the very few people trying to channel widespread anger into activism rather than resignation, and thus deserve support and encouragement—and help—from anyone claiming to be sympathetic to their underlying message. [A]sk yourself how you might act if you were in school or fresh out of it or young and unemployed. What future has Wall Street, the heart and brain of our capitalist country, promised you? How does it feel to be the sons, daughters and grand kids of a “me” generation that’s run up the debt and run down the economy?Unemployment is between 13% and 25% for people under 25. Student loans are defaulting at about 15% at a time when more young people have no alternative but to borrow to pay for school. Meanwhile, Wall Street bonuses continue to be paid at close to all-time highs. Lloyd Blankfein, the chief executive of Goldman Sachs Group Inc. (NYSE:GS), took home $13.2 million last year, including a $3.2 million raise. 2. They made a great poster. I write this partially in jest. There is a joke among labor organizers that if you are spending all your time obsessing over the quality of your posters or handouts, rather than going out to actually talk to people, you are in big trouble. In this case, however, there’s some truth to the idea that posters matter. When you’re not mobilizing an established organizational membership, but rather trying to capture the imagination of unaffiliated activists, protest planning is more akin to promoting a concert than staging a workplace strike. And if you’re doing that kind of promotion, how cool your call to arms is makes a difference. 3. They gave their action time to build. Most protests take place for one afternoon and then are finished. Had #OccupyWallStreet done the same, it would already have been forgotten. Instead, planners told participants to get ready to camp out. The event operated on the premise that challenging Wall Street would take a while, and that things would build with time. In fact, this is exactly what has happened. It took a few days for alternative press sources to catch on, but now the occupation is a leading story at outlets such as Democracy Now. 4. They created a good scenario for conflict. By claiming space in Zuccotti Park (also known as Liberty Plaza), #OccupyWallStreet set up an action scenario that has effectively created suspense and generated interest over time. Participants there have invoked Tahrir Square. On the one hand, the comparison is silly, but on the other hand, the fact that occupations of public space have taken on a new significance in the past year is another thing that made #OccupyWallStreet a good idea. If the authorities allow them to continue camping out in lower Manhattan, the protesters can claim victory for their experiment in “liberated space.” Of course, everyone expects that police will eventually swoop in and clear the park. But, contrary to what some people think, civil disobedients have long known that arrests do not work against the movement. Rather, they illustrate that participants are willing to make real sacrifices to speak out against Wall Street’s evils. The fact that police have used undue force (in one now-famous incident, pepper spraying women who were already detained in a mesh police pen and clearly doing nothing to resist arrest) only reinforces this message. When will the police finally come and clear out the occupation’s encampment? We don’t know. And the very question creates further suspense and allows the protest to continue gaining momentum. 5. They are using their momentum to escalate. Lastly, but probably most importantly, the #OccupyWallStreet effort is using its success at garnering attention in the past week and a half to go even bigger. 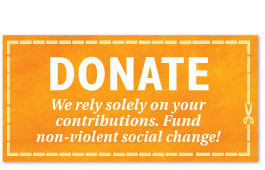 Their action is creating offshoots, with solidarity protests (#OccupyBoston, #OccupyLA) now gathering in many other cities. Protesters in Liberty Plaza are encouraging more participants to join them. And they are preparing more people to risk arrest or other police reprisal. It might seem obvious that a protest movement would treat a successful event as an occasion to escalate. But, in fact, it is quite rare. More established organizations are almost invariably afraid to do so: afraid of legal repercussions, afraid of the resources it would require to sustain involvement, afraid of bad press or other negative outcomes. Such timidity is anathema to strategies of nonviolent direct action. In this respect, the fact that #OccupyWallStreet has not relied on established progressive organizations ends up being a strength. Its independent participants are inspired by the increasing attention their critique of Wall Street is getting, and they are willing to make greater sacrifices now that their action has begun to capture the public imagination. This can only be regarded as a positive development. For the more that people in this country are talking about why outraged citizens would set up camp in the capital of our nation’s financial sector, the better off we will be. #OccupyWallStreet protesters have gotten that much right. This entry was posted in About the Center, About the Center, Faith and Poverty, Featured Articles in Sidebar, Living Wages, Living Wages, New Campaigns, Strategic Nonviolence. Bookmark the permalink. ← Christmas Appeal: Hope: If We Follow the Spirit, Great Things Will Come to Pass.